This was the day in which the series sprung to life. Steyn found his pace and menace as England slumped to 284-6 and it seemed at that stage that every ball could take a wicket. A typical counter-attacking 60 from Matt Prior and decent support from Stuart Broad and Graeme Swann helped England to a reasonable 385. South Africa bowled very well, but the batsmen would be disappointed with the way they got out; Cook played on; Bopara played a horrendous shot to a ball saling over his head and edged it; Bell left a straight ball and Bresnan played on off a Tahir long hop, though it has to be said that Bell was set up brilliantly by Kallis. 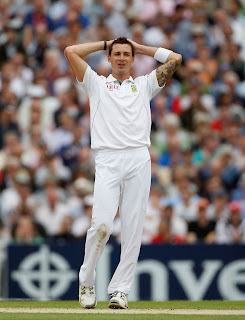 England started their bowling effort promisingly with Anderson getting Alviro Petersen plumb LBW with a huge inswinger. Thereafter, the sun came out, the swing disappeared, and it produced the best batting conditions of the match. England's spark disappeared after a lengthy delay for rain and Graeme Smith and Hashim Amla ensured that SA finished the day on 86-1. Honours even at the close.